UPDATE: (From Donna Y.) "Hi, there is a trick to purchasing the tickets. You have to choose Group Tickets. Then Event. When it pulls up the different games choose the Miami vs EK and click it on. The next screen go to the middle area of that screen and in small print it will ask if you have a passcode for a group purchase. Enter the passcode: BANDDAY2014 and it will immediately take you to a purchase screen. Then purchase the number of tickets. They are $10 plus tax each. When making your purchase you can choose to print off the tickets or pick them up at the stadium. I printed mine. " 2) In the "Group Sales Password/Promo Code:" box enter "BANDDAY2014"
Pics from "Meet The Teams Night" are on the picture page! For the first time EVER, we will host a Fairbanks Alumni Marching Band on Friday, October 3 at our homecoming game. There has been some interest for years, but the pieces are finally falling into place for this to finally happen and we couldn't be more excited! The best place for alumni to keep up with the goings on of this big event is on the Facebook event page, where they can RSVP and keep up to date with changes as the date draws nearer. I will need to know at least a week ahead of time who all is coming so I can get you in free and also make sure I have an instrument for you if you are a percussionist/low brass/mellophone. The Fairbanks Marching Band leadership team (squad leaders and seniors) will be attending a leadership seminar on Friday, August 22 at Dublin Coffman High School 6:30-8:30pm. 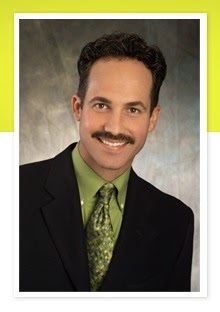 The speaker is nationally renowned and long established speaker Mr. Fran Kick. The workshop fee is paid so there is no cost to attendees. UPDATE: Transportation will be provided. We will load at FHS at 4:45pm and depart at 5pm for Dublin. We will stop at the Perimeter loop area for dinner (I'm thinking Chipotle) - please bring money for food. After the event, we will head back to FHS and arrive around 9:15pm. Thank you so much for the tremendous turnout and interest at tonight's Fairbanks Music Boosters meeting. Meetings are now regularly set for the second Tuesday of each month at 7pm in the FHS band room. Congratulations to the booster officers for the upcoming year who were elected at tonight's meeting! 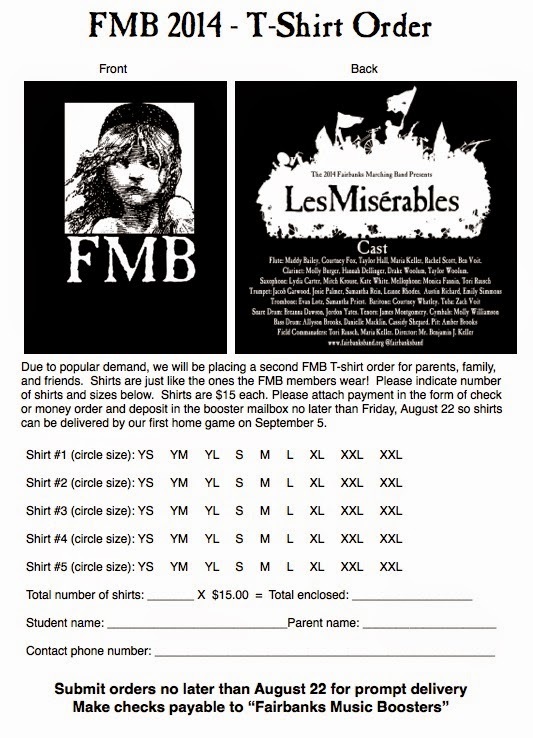 Due to popular demand, we will be placing a second FMB T-shirt order for parents, family, and friends. Shirts are just like the ones the FMB members wear! Please indicate number of shirts and sizes below. Shirts are $15 each. Please attach payment in the form of check or money order and deposit in the booster mailbox no later than Friday, August 22 so shirts can be delivered by our first home game on September 5. Click the order form to download one. Forms will be sent home with students on August 13 as well. 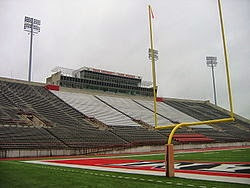 The FMB will travel to Oxford, Ohio, for the re-invention of their annual Band Day. A tradition that dated back to the 1960's was phased out by the athletic department a few years back, but by popular demand it is being revived. We will head out in the morning and arrive at 11:15 and rehearse with the Miami band and a dozen other high school bands. We'll get to perform to tailgaters prior to the game then be a part of the festivities as Miami kicks off their home season against Eastern Kentucky University. We'll return home after the game and be back at FHS around 8pm. More details will become available as we draw nearer to the event. 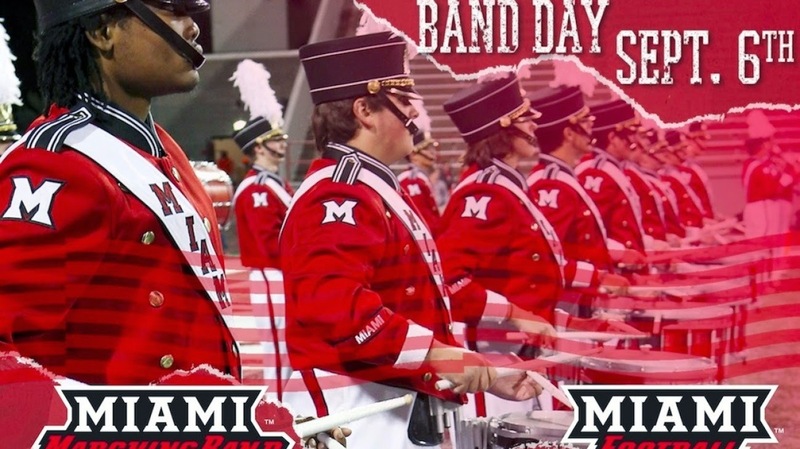 Band members will get printed music during the first week of school, but can download it in advance, as well as listen to a recording of the arrangements and play along at the Miami Band Day site. Can you believe that the FMB is already off and running?!! That means school is just around the corner! First off we want to thank all of you for a successful band camp ! Check-in and Check-out were super easy this year! Thank you all!! We have a regularly scheduled booster meeting scheduled for Tuesday, August 12 at 7pm in the band room. We are in desperate need of bodies at this meeting so that we can nominate and vote in new officers for this season. Without a full roster of booster members, we will be unable to continue the booster organization and that will only hurt the band kids.